Your best options are Portsmouth to St Malo on Brittany Ferries, or Plymouth to Roscoff also on Brittany ferries. From Roscoff, Guergilles is an hours drive, and the drive from St Malo will take 2 hours. 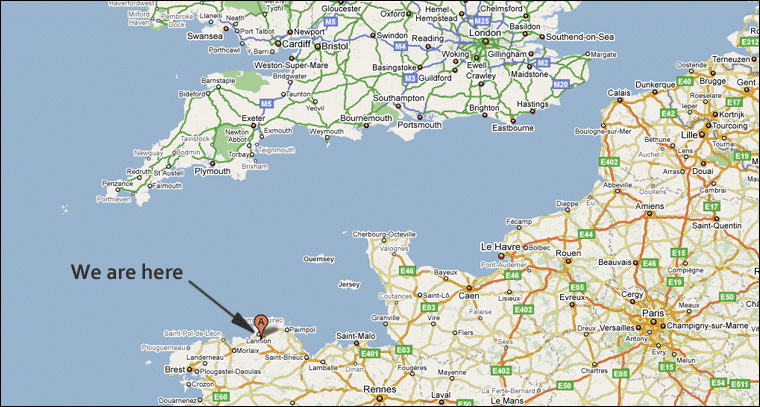 From the Channel ports of Cherbourg and Caen the journey takes about 4 hours. Guergilles is 500km from Paris, and by road the journey will take about 5 hours. Ryanair have flights from Luton to Brest, or from Stanstead to Dinard. Flybe have flights from Southampton, Exeter and Birmingham to Brest. Guergilles is an hours drive from Brest and two hours from Dinard. Car hire is available from both airports. If you should chose to fly, we recommend that you hire a car. To get here from the UK by train, take the Eurostar to Paris and then the TGV from Paris to Plouaret-Tregor. Trains leave from Gare Montparnass and take about 3.5 hours. Plouaret-Tregor is 10km from Guergilles and is on the Paris to Brest line.